Animals in the wild are hard to study because they can take a long time to come into a camera's field of view. 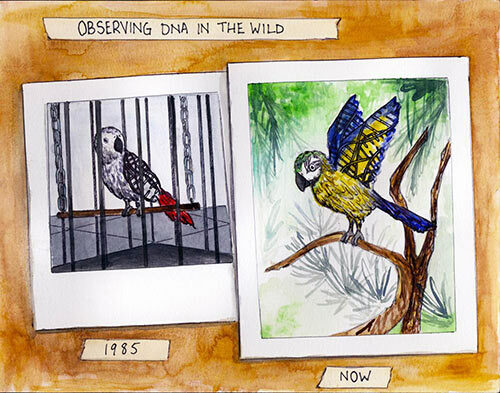 The same observational challenge applies to the study of DNA in its native conditions. Dr. Zhang noted that while the new technique is more labor-intensive than a melting curve, it generates far more accurate results, as proven by the hundreds of molecules his lab has already analyzed. The errors that the Zhang research team has encountered are roughly tenfold lower than previous methods; this allows for more accurate rational design of DNA diagnostic reagents. A high-resolution melt experiment would have to be repeated dozens of times to generate an average result with close to the same precision, he said, but even that would not mitigate errors from testing under unrealistic conditions. Typically, to study the behavior of a particular DNA sequence—for example, one that is specific to a virus—researchers would heat and cool the molecules to observe their fluorescence at different temperatures. Using rules of thumb, researchers would then guess the DNA's properties at temperatures other than the one measured. However, such approaches are inaccurate because the way a DNA molecule behaves at 75°C is a poor predictor of how it behaves at 37°C. “Our goal is to build a database of good DNA and RNA thermodynamic parameters. Melt curves done in the '80s and '90s are too crude,” Dr. Zhang explained. “Unfortunately, that's what people in diagnostic and life sciences research use today because there's been no better method.